Andy Fletcher left Wednesday's Diamondbacks-Rockies game in the 7th inning due to a HBP head injury. Fletcher receives medical attention at Coors. With none out and none in the top of the 7th inning, Diamondbacks batter Chris Iannetta took a 97.4-mph fastball from Rockies pitcher Carlos Estevez for a hit-by-pitch, which caromed off Iannetta's left hand and into the upper left quadrant of Fletcher's traditional-style facemask. 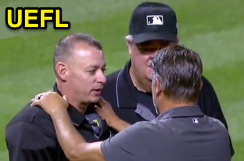 Fletcher was replaced by 2B Umpire Ron Kulpa, while base umpires Alan Porter (1B) and Crew Chief Joe West (3B) officiated the field for the remainder of the contest. Relevant Injury History: There is no recent relevant (e.g., head) injury history. Fletcher suffered a broken wrist in June 2012 after an errant Brandon League pitch bounced into the dirt and caromed into Fletcher's right forearm. Fletcher was hit by a foul ball while working the bases, forced to leave a game, just one month earlier.